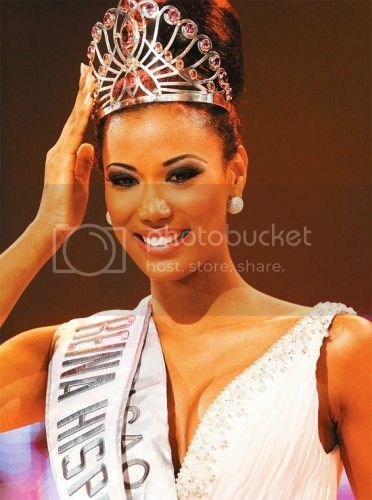 Miss Curacao, Evalina Van Putten won the title of Reina Hispano Americana 2011 or internationally known as Hispanic American Queen 2011 pageant which was held last October 27 at Fexpocruz Santa Cruz, Bolivia. She was crowned by Reina Hispanoamericana 2010, Caroline Medina. Standing 1.84m tall, 20 year old Eva van Putten also competed in Miss Universe 2011. Declared as "Virreina" was Miss Chile, Maria Jesus Matthei. 1st run-up was Miss Bolivia, Yessica Mouton. 2nd run-up was Miss Ecuador, Olga Alava. Placed as the 3rd run-up was Miss Paraguay, Alba Riquelme. While 4th run-up position was given to Miss Spain, Spain, Alba Fortes. And finally, the 5th run-up was Miss Venezuela, Angela Ruiz.